St. Sofia Cathedral is the world famous historical and architectural monument of the first half of the 11th century. The name of the cathedral comes from Greek word «sofia», which means «wisdom». Built in the times of Yaroslav Mudry, the cathedral served as a social, political and cultural center of Kievan Rus, where foreign ambassadors were received, chronicles were recorded and the first Russian library, founded by Yaroslav Mudry himself, functioned. Yaroslav Mudry's ruling was the time when art, education and culture prospered. As of Kiev, it became one of the most beautiful cities in Europe and Asia. Construction of Sofia cathedral played an important role in Kiev's look formation. The cathedral was founded in 1037. Originally it had 5 naves and was surrounded with 2 circled galleries. During the centuries the architectural look of the cathedral had been changing. The cathedral was badly damaged during the Tatar yoke and then restored; it was burned many times and was reconstructed again. In 1707 St. Sofia cathedral was rebuilt in the style of Ukrainian baroque and topped with typical pear-shaped cupolas. Nowadays the building of the cathedral combines constructions of the 17th, 18th and 19th centuries. In the temple erection in different times participated such architects as Shedel, Sparro, Zaborovsky and others. For many years St. Sofia Cathedral served as a burial place of Kiev princes. In the cathedral remains of Yaroslav Mudry, his son Vsevolod, and Vladimir Monomakh are buried. The cathedral is famous for its mosaics and frescos by Byzantine masters that date back to the 11th century. Marvelous frescos decorate walls, pillars and vaults. Inside, the central part of the cathedral is decorated with large mosaic depicting praying Virgin Maria. The mosaic is 6 meters high and consists of stone and glass plates of different colors and hues. Some frescos are especially interesting from both historical and artistic points of view, as they represent not only Holy Bible subjects, but also secular ones. For example, in the cathedral one can see portraits of Yaroslav Mudry family members. The belfry is decorated with paintings of the 11th century depicting scenes of the games arranged in Constantinople by Emperor Constantine in honor of Princess Olga. Paintings represent clowns, jugglers, musicians, dancers, animal trainers and chariot races. Notes and images on the walls and architectural details of St. Sophia Cathedral, known as Sophia graffiti, are of great historical value. About 300 graffiti relate political events of ancient days and historical personalities. The earliest notes gave the historians opportunity to define time of the cathedral construction and decoration more accurately. Nowadays St. Sofia Cathedral is an architectural and historical preserve. 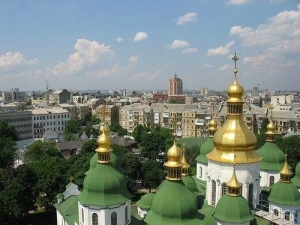 It ranges among the most beautiful temples of Kiev and the major attractions of the capital of Ukraine.